Yes, there was a tax-day deadline that served as a top headline for myriad national sports outlets. And yes, trade speculation has emerged as doubts about the team’s willingness to meet that deadline swirl. But despite all the histrionics this April, despite all the chatter and hypothesizing, the truth about Russell Wilson’s future is this: The Seahawks still have all the leverage. Last week, Wilson made news by saying he wants Seattle to hammer out a contract extension for him by April 15. His camp’s reasoning is that the quarterback market won’t change over the next few months, so there’s no reason to wait until the summer when the team can act now. Offering an extension this early would be an unprecedented move for the Pete Carroll-John Schneider-era Seahawks, but you could argue that Wilson is the most valuable player this organization has ever had. So why wait? Mailbag: Could the Seahawks get creative with Russell Wilson's contract? Calkins | Russell Wilson set the deadline. But the Seahawks hold all the cards. Wilson would likely command an extension that pays him around $35 million a year, which would make him the highest paid player in the NFL. That would be about $12 million more than what he’s receiving annually on his current contract, which expires after the 2019 season. Given the numbers Wilson has put up in Seattle, particularly last year, when he posted a career-best 110.9 passer rating, he has certainly earned a payday. But other than avoiding some possible tension, what good does it do the Seahawks to fully commit to Wilson over the next few days? For one, organizations do not like breaking precedents, regardless of who it’s for. Doing so opens the door for future players to make similar demands and complain of preferential treatment if those demands aren’t met. 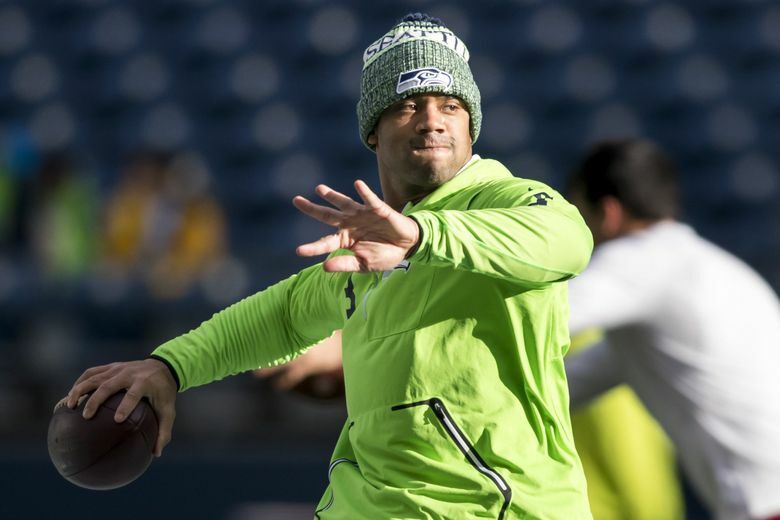 More significantly, with the franchise-tag option, the Seahawks can keep Wilson around for three seasons for about the same annual cost as a long-term contract. Would they risk losing him after that? Yes. But could they also try and lock him up a year or two from now? Yeah, they could. If no deal is completed this spring, and Wilson opts not to negotiate until after the season, the Seahawks can still franchise him in 2020 for about $30.6 million. They can do so again in 2021 for just over $35 million. It wouldn’t be till 2022 that tagging Wilson would cost Seattle more than $50 million, but Carroll’s contract would be up by that point and Wilson — known for his mobility — would be 34 by season’s end. I suppose one risk is that if Wilson is unhappy he could sit out in protest. This last contract guaranteed him more than $78 million, and his wife has a dollar or two, so he won’t starve. But do you really see him doing that? Can you see the guy who talks incessantly about “the process” and his love of the game and his passion for competition opting to hold out? I can’t. I suppose another risk is that an unhappy Wilson could be a source of friction. But do you see that affecting his performance? Russell’s wiring is different than others. Even if he is disappointed off the field, he won’t be anything but focused on it. Not only does that seem to be in his nature, but it’s in his best interest financially, too. Plus, remember all that tension that reportedly existed between Tom Brady and Bill Belichick? That story came out two falls ago. The Patriots ended up going to the next two Super Bowls and winning one of them. Between Wilson, Bobby Wagner and Frank Clark, there are a lot of moving parts when it comes to Seattle retaining high-end players. It’s not easy trying to assure short-term success while maintaining long-term financial flexibility. There are a multitude of paths the Seahawks can take this offseason or in the years to come. But despite all the noise, they know they don’t have to do anything right now.